There was a time when sending money from one place to another involved standing in long bank/post office queues, patiently awaiting your turn till you finally reached the counter only to be faced with a mountain of forms to fill. Until technology and the internet came to our rescue and presented us with a much faster, reliable and secure option – money transfer apps or simply e-wallets. Now sending money to anyone in India (and abroad) can be done in a matter of minutes from the comfort of your home/office using these apps. 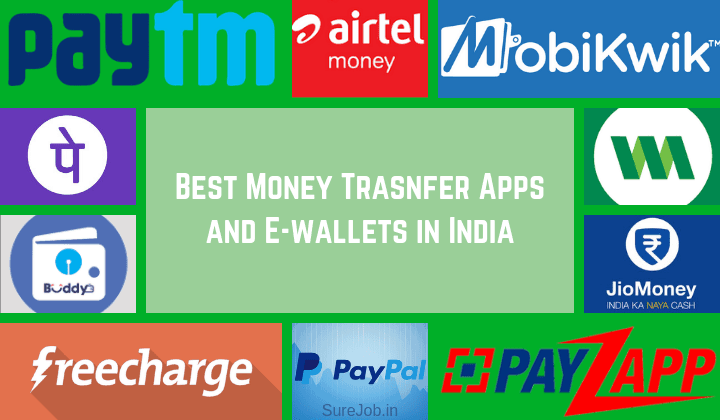 In this article we will share information on 10 best money transfer apps in India that you can use to send money to your near and dear ones in times of need with the minimum hassle. Though there are hundreds of best e-wallets in India, these 10 are the most used digital wallets in India. With 150mn-plus users’ pan-India, Paytm is easily the country’s largest digital payments gateway and arguably one of the best money transfer apps in India. It offers a comprehensive list of payment services for both customers and merchants to make seamless payments using the App, from banks, credit/debit cards and digital credit among others. Paytm is one of the top 10 online shopping sites. The Paytm app also allows users to transfer money from their digital wallet to bank account (and vice-versa) and make online payments for a host of services like paying utility bills, buying mobile/DTH recharge and shopping online. Available for use at more than 2,50, 000 online and offline avenues, Mobikwik is yet another free digital wallet app for money transfer in India. Super-secure, with every penny in your e-wallet accounted for always, the MobiKwik app is operational on Android, Windows and iOS. In addition to money transfer, this app can also be used to make your EMI payments, buy a mobile recharge, book rail/bus tickets and pay your gas/electricity/DTH bills online. Apart from that it provides best cashbacks and discounts which helps us to save money. From UPI payments to mobile/DTH recharges, money transfers to making online bill payments, you can do it all this and more using the PhonePe app. Registered users can send and receive money from their friends and family and transact up to INR 1 lakh per transaction (24*7) – anytime, anywhere – using this cash transfer app. You also get to check your account balance, save beneficiaries and manage multiple bank accounts, in addition to getting refunds and cashbacks to your bank account in an instant. Another online money transfer app which is made available in India is Freecharge. FreeCharge users get to make their utility bill payments, buy metro/mobile recharges, do Google Play recharges, invest in mutual funds and also make charitable donations online. They can also send & receive money in an instant, create BHIM UPI ID and link their bank account to engage in the convenience of instant funds transfer. As an added bonus, this app also allows you to buy amazing discount coupons from all your favourite brands starting at just ₹1. By virtue of being the first payments bank in India to integrate the UPI on its digital platform, Airtel Money can facilitate instant fund transfers between two bank accounts on its mobile platform. All you will need is a Virtual Payment Address (VPA) and MPIN to complete the transactions. There is no need for sharing the beneficiary’s account details. You can also create a VPA and link your bank accounts to it using the My Airtel App and further personalize this with your name and/or number. Jio Money is a smart money app that allows users all the benefits of using cash – sans any of its limitations. It is an easy money transfer app that will empower you to be able to make payments from anywhere and at any time. Using this app, you can also transfer the funds in your Jio Money wallet to other Jio Money users and bank accounts too. Plus, you get to enjoy some great offers, deals and coupons from leading brands, pay your bills and recharge mobile/DTH and indulge in shopping from your neighbourhood stores. Touted to be India’s easiest, safest and fastest money transfer app, Ola Money claims to offer users an all new user experience and a one tap access to all their daily needs. This includes the ability to send money to your loved ones anytime, anywhere with just a tap on the app. You can even transfer your Ola Money from your mobile wallet to your bank account. With Ola Money your just one click away from paying for your prepaid mobile recharges, postpaid mobile/power/gas bills and of course the fare for the Ola cab you just hired. The Indian subsidiary of one of the world’s most popular and widely used digital payments platform, PayPal India allows registered users to receive and make payments anywhere in India and abroad. All you need to do is register on the site and link your PayPal account to your designated bank account and you’re good to go. You can also transfer money from your PayPal India account to your bank account in the blink of an eye. All monetary transactions made through PayPal are safe and protected by advanced encryption and 24-hour fraud monitoring, without exposing your personal financial information. It is the first Indian mobile digital wallet that is supported in 13 languages. And it comes loaded with several unique features like – Send money to registered and new users, Ask money and Send reminders to settle dues. You also get to transfer additional cash into an account of their choice, absolutely free of cost. This is in addition to regular benefits which includes, recharging and paying your bills instantly, booking movie/flight tickets and shopping for your favourite products online. It’s been launched by HDFC Bank, one of the largest private sector banks in the country. With PayZapp, you can send money to anyone in your list of contacts or credit the amount directly to your bank account. You can also link your Debit and Credit Cards (from any bank) to this app to make instant and secure payments for your data plan/DTH, buy movie tickets, pay for your groceries and book flight tickets and hotel rooms. Plus you also get to shop online and enjoy massive discounts at SmartBuy – HDFC bank’s e-commerce platform which offers an extensive range of digital and physical products. With so many reliable app options at hand, transferring your hard earned money should be a breeze for you now. And mind you, all of the above online money transfer apps come with state-of-the-art security protocols in place at every step of every monetary transaction you make – so you can rest easy with the confidence of knowing your money is completely safe at all times. So go ahead and take your pick. And don’t forget to let us know how it went. Informative Article, Thanks for sharing!!! if any one wants to transferring money online with attractive commission & cashbacks. i suggest cubber merchant app from play store. it provide assured cashback and commissions on each and every services.